Visiting Cape Town in September or October is the perfect time to enjoy the best the Mother City has to offer. Not only is spring characterised by lovely mild temperatures but it’s the time of year when Cape Town bursts into bloom. Spring flowers in Cape Town bring colour to the lush greenery of the wet winter months and the promise of new life in the air ignites a renewed sense of adventure, resulting in tourists and locals flocking to the city’s most marvellous attractions. With so many special things to do in Cape Town it may be hard to decide on a spring outing. Here are our top picks. The Zeitz Museum of Contemporary Art Africa is not only the largest art museum on the continent but the largest museum in the world showcasing the art of Africa and its diaspora. With an exhibition space of over 6,000 square metres over nine floors, with 100 gallery spaces it’s worth setting aside an entire day when visiting the museum. However, the art is only one part of the museum’s allure. Housed in the V&A Waterfront’s historical old grain silos, which were built in 1921, the Zeitz MOCAA is an architectural masterpiece that awakes a sense of wonder. The architects were tasked with creating a design around the historical landmark that would preserve its recognisable exterior. The end result is a building with an iconic exterior and an interior that makes best use of space and light while retaining elements of the original silos. The inner workings of the old industrial structure have been carved out into a series of curved concrete lines resembling the shape of an enlarged grain of corn. With light pouring in through the cylindrical silo structures revealing a cross-section view of the original construction, the museum itself is a work of art. An outing to this world-renowned site is one of the best things to do at the V&A Waterfront on a lovely spring day. Visiting Cape Town in October – or any other month of spring – wouldn’t be complete without taking a day to explore the beautiful winelands. Of the Cape’s many wine regions, Franschhoek Valley is arguably one of the most exceptional and prestigious. A visit to this scenic area is high on our list of best things to do in Cape Town on a lovely spring day. Nestled at the foot of the majestic Franschhoek Mountains, the historic town of Franschhoek is known for its warm hospitality, world-class cuisine and fine wines. One of the best ways to immerse yourself in the world-renowned winemaking culture of the Franschhoek Valley is by booking a tour on the hop-on, hop-off tram. This captivating tour, with six different routes to choose from, consists of a combination of double-decker tram and open-air tram-bus transport. Starting at the ticket office in the centre of the Franschhoek Village, travellers are taken on a loop of stops at eight wine estates, each with a unique offering. The tram or tram-bus passes each stop once every hour, allowing visitors to continue the tour at their convenience. The next highlight on our list of best things to do in Cape Town brings together all the elements that make for a perfect spring day out: a fresh ocean breeze, spectacular views and well-crafted gin served in a sensational seaside sanctuary. The Twelve Apostles Hotel is elevating gin to a new level with their superb gin tasting experience allowing visitors to enjoy their own uniquely crafted blend by pairing three local gins with a variety of three different tonic waters and a variety of botanicals and spices. The gin and canapé tasting puts an appetising spin on the experience with three gin and tonics paired with three divine canapés prepared by Chef Nicholas Goldschmidt. Guests who’d like to take things up a notch may opt for the gin-making experience. After being welcomed with a gin and tonic on arrival, visitors are guided by the hotel’s resident mixologist in crafting their own bottle of gin. The Gin Lab @ The Conservatory at the Twelve Apostles Hotel & Spa is open daily from 11am until 9pm. Visiting Cape Town in September you have the opportunity to witness one of the most spectacular annual wonders. Fields burst into colour as wildflowers blanket the landscape; and from August, blooming canola fields ignite the hills in bright yellow. The best way to see the magnificent display of spring flowers in Cape Town is driving out to the countryside. Located only an hour’s drive from the Mother City, the Riebeek Valley is the perfect destination for a day outing. During spring, this scenic area boasts an abundance of arum lilies along fences of farms and a rather lavish display of oxalis and fynbos, while canola fields outside the quaint town of Riebeek West make for a great photo opportunity. Driving into Riebeek West, visitors are welcomed by the warm hospitality of locals. To experience the unique way in which locals catch up and visitors make friends, we recommend visiting one of the local markets. The vibrant Short Street Market in Riebeek West, taking place on the last Saturday of every month, is a great place to shop for unique crafts and enjoy home-made food and fine wines; while the Village Market Allesverloren, open every first Saturday of the month, has an equally impressive range. From freshly baked farm bread and farm butter, pork pies, African Fusion, Indian cuisine to traditional South African foods. Other offerings include plants, herbs, pestos and an outstanding organic garden vegetable with farm-fresh produce – there is something for everyone’s taste. Spring is the season of love. 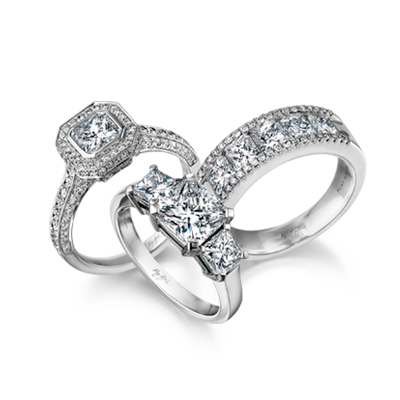 What better way to reignite your romantic spark than by admiring the timeless beauty of a diamond? If you are looking for special things to do in Cape Town this spring, a visit to one of Shimansky's Diamond Experiences is a must. The Shimansky Rockwell Diamond Experience showroom is ideally located in the trendy De Waterkant Village in Green Point, Cape Town. The first of its kind, this unparalleled experience offers visitors a once-in-a-lifetime opportunity to polish diamonds under the guidance of a Shimansky master craftsman, giving guests a better understanding of the skill required to perfect each Shimansky diamond jewellery creation. Shimansky’s Diamond Experience Tour at The Clock Tower in the V&A Waterfront is equally fascinating. Whether you are planning to get engaged, have an upcoming anniversary or special occasion, or simply love the beautiful sparkle of a diamond, a visit to Shimansky’s flagship showroom will leave you amazed – it’s certainly one of the best things to do at the V&A Waterfront. The tour starts with a visit to the Cape Town Diamond Museum where visitors are taken on a historic journey that reveals the fascinating stories behind the world’s most famous diamonds. Guests are then escorted to the Shimansky Diamond Cutting and Polishing Workshop to witness Shimansky’s master craftsmen meticulously cutting rough diamonds into signature jewellery designs. The tour’s highlight – a visit to the Shimansky flagship showroom – allows visitors to see Shimansky’s diamond and tanzanite collections – the perfect moment, perhaps, to acquire an exquisite South African souvenir for the special person in your life? Booking is by appointment only for The Shimansky Diamond Experience Tour at the Rockwell Hotel in Green Point, while walk-ins are welcome at The Shimansky Diamond Experience Tour at The Clock Tower in the Waterfront and at the V&A Shimansky Showroom.